Dual polished oval aluminum mufflers. Spring mounted and slip fit for durability. 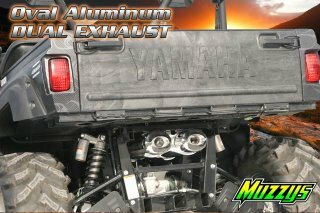 This is the ultimate exhaust choice for Yamaha Rhino 700. 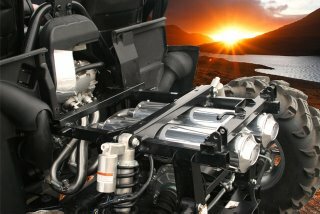 Fully tuned equal length headpipes merge from 2 into 2, creating the most powerful Rhino exhaust available. The polished oval aluminum canisters feature billet aluminum inlets and outlets. Each canister comes standard with the Muzzy Modular Endcap system that includes a removable USFS approved spark arrestor and quiet core. The muffler canisters are held via a trick looking CNC machined aluminum bracket. The integrated oxygen sensor bung allows the addition of an air/fuel meter. The dual oval muffler design helps keep sound levels to a minimum while maintaining the incredible Muzzy exhaust tone. Detailed installation instructions are included.